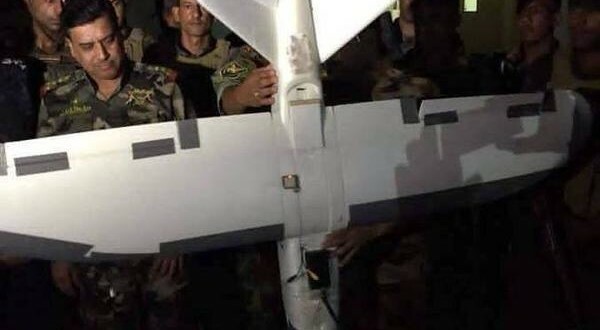 On 3 October 2015 it was reported that Iraqi Federal Police had shot down a small unmanned aerial vehicle (UAV) flown by Islamic State forces, east of Ramadi. 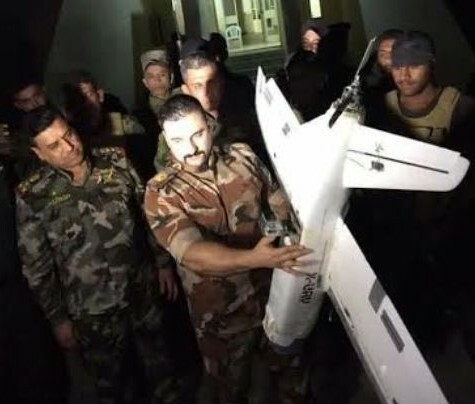 They indicated the UAV was being used to monitor and photograph military units deployed in Anbar Province. Photographs of the UAV indicate it was an X-UAV Talon manufactured in China. The X-UAV Talon comes in kit form as a first-person viewing (FPV) model aircraft for hobbyists. It retails for around $100 USD not including servos, radios and cameras, using a v-tail design composed primarily of EPO moulded foam. With a rear pusher propeller, the X-UAV Talon frees the nose up for a forward looking camera. Its wingspan and length are 1.7 m and 1.1 m respectively, and its maximum weight is between 2.5 and 3.0 kg. A general rule of thumb indicates that payload capacity for a UAV of this size would be approximately 20% of the UAV weight, or around 500-600 grams. The manufacturer recommends a brushless electric motor with 12 inch or smaller propeller. The Talon had an unidentified propeller and motor, but it appears larger than those most often seen in advertising material for this model of UAV. The UAV was equipped with a satellite navigation unit mounted on the wing which suggests it was using telemetry or an on-screen-display (OSD) usually associated with FPV flying. One data link or video transmitter is clearly evident in front of the wing on top of the fuselage. What appears to be a GoPro camera case, believed to be mounted on a gimbal, is seen on the fuselage underneath the wing (see below). Another possible antenna is located on the forward fuselage next to the aforementioned transmitter. No antenna for the control radio can be seen, so it is possible that this forward fuselage one is used by the control system. Alternatively, it could be another live video stream from the bottom camera. Control and data/video radio links would probably be operating at two or three of the following frequencies: 1.2 GHZ, 2.4 GHz and 5.8 GHz. Video encoding would most likely be PAL. The downed aircraft appeared to be well built and maintained. It was unpainted leaving it primarily white. Tape was added to the wing leading edges, nose, and control surfaces. This is a common technique for increasing the durability of lightweight, fixed-wing aircraft, which suggests that Islamic State forces intended to use the aircraft for multiple flights. 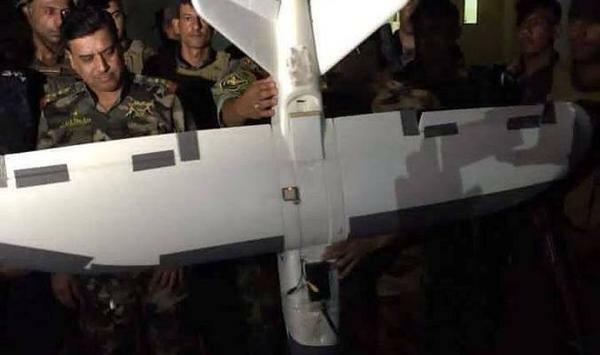 The relative sophistication of this aircraft demonstrates that the Islamic State has at least some amount of unmanned aircraft development knowledge, as well as access to materials. ARES is currently monitoring the prevalence of commercial off-the-shelf UAVs with non-state armed groups for a forthcoming report.